A glorious pair of 18ct White Gold matching wedding bands, designed in collaboration with a very happy couple to celebrate their special Wedding ceremony. This stunning pair of matching wedding rings were designed in collaboration with our clients who wanted matching wedding bands with subtle differences in style and finish. Julian Stephens created a pair of identical flat wedding bands from solid 18ct White Gold, adding a minimal but stylish laythed band detailing to one ring and a flash colour with opulent, precious gemstones which are expertly flush set into the solid gold band. 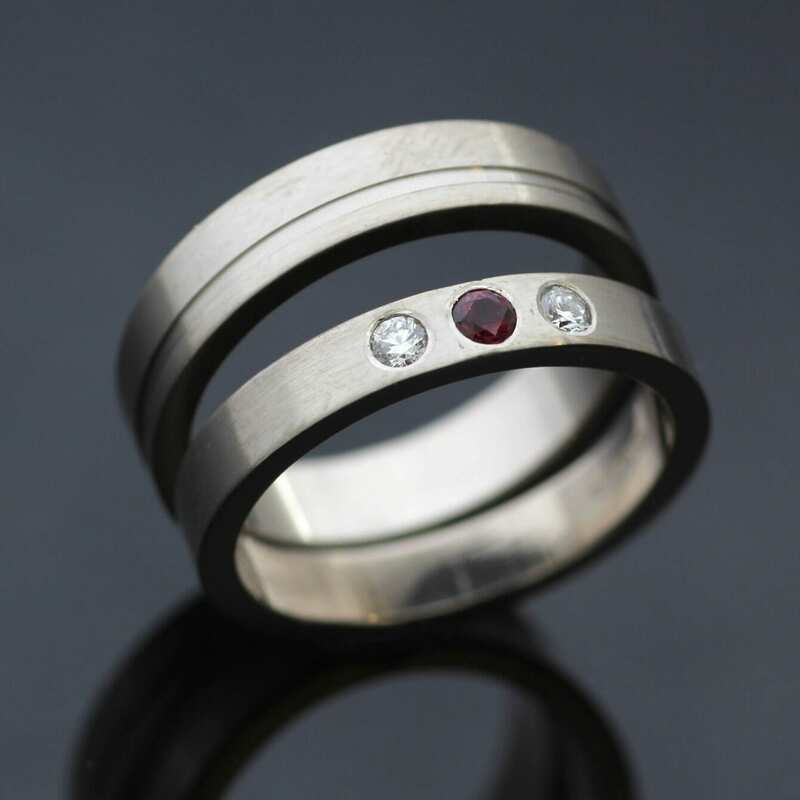 Sourcing three stunning Round Brilliant cut Diamonds & Ruby gemstones which were then approved by our clients adds a beautiful pop of colour and a unconventional finish to these special wedding rings. Each wedding band is then lovingly completed with a beautiful satin finish for a chic matt effect and both rings proudly bear Julian Stephens exclusive makers mark and Hallmarking as a sign of their quality and craftsmanship.